Sheridan, Vanessa. Transgender in the Workplace: The Complete Guide to the New Authenticity for Employers and Gender-Diverse Professionals. Praeger, 2018. ABC-CLIO, publisher.abc-clio.com/9781440858079. 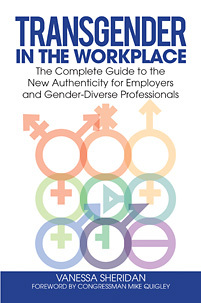 Offering a fresh and practical perspective for employers and gender-diverse professionals, this book presents useful tools, information, and resources to help organizations and individuals to understand and leverage the power of gender authenticity as a pathway to business success.